The Union Station Patsaouras Bus Plaza will reopen on Monday, Oct. 10 for buses and shuttles. Here is the map with updated bus bay assignments; you’ll notice that some buses will continue to use the stops at Cesar Chavez and Vignes and/or Alameda Street instead of entering the plaza. These lines include Metro Line 68, 70, 71, 78-79, 378 and 770, DASH Lincoln Heights/Chinatown and BoltBus. The other major change is: private vehicles will no longer be allowed to access the plaza. 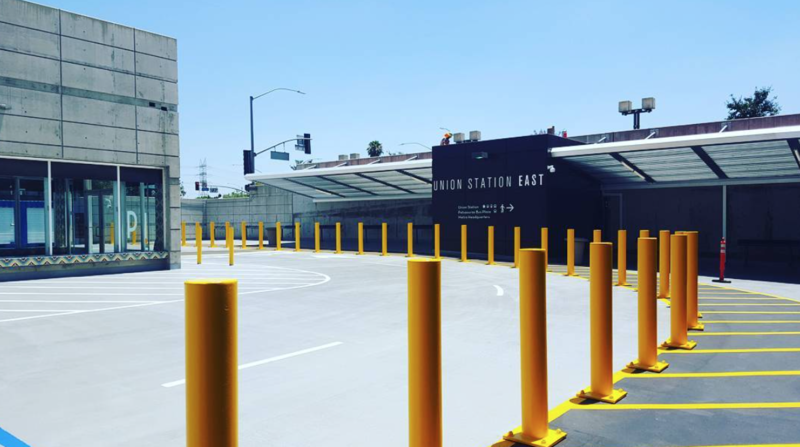 If you’re dropping someone off, or getting picked up by a friend, family member, Lyft or Uber, you will continue to use the new underground Union Station East Passenger Pick-up/Drop-off Facility. The facility provides room for curb-side pick up and drop off, as well as twenty 10-minute waiting spaces. The entrance is on Vignes Street. Check out the video below for a quick guide of the facility and how to access transit from the area. By moving private vehicles to their own dedicated area, it will be safer for passengers to be picked up and dropped off. It will also improve traffic flow in the plaza for buses and shuttles. Plaza reconstruction work included waterproofing, storm drain and paving repairs. The project also added pedestrian safety fencing along the perimeter of the plaza. Sorry about any confusion, the map has been updated with correct link. FlyAway bus will return to the plaza using bus bay 1. Are you sure that’s the correct bus stop map? It is dated July 2016 and shows the temporary stops. Sorry about that, the link has been corrected with the updated map! The video is helpful. Thanks! Hmmm. Still no Silver Line stop at the bus plaza. What’s holding that up? Whoever created the map could have included the stops at Cesar Chavez/Alameda. It’s much easier for wheelchair users to get into Union Station from that intersection than at Cesar Chavez/Vignes. We don’t have to climb that steep hill!